TWPT: It has been many moons since we last spoke here on TWPT and the last time was about your artwork. I think you were working on a tarot deck back then called The Well Worn Path but you've had another one since then in 2014 called The Mystical Cats Tarot. How has the Mystical Cats tarot deck been received by your fans? MM: It’s been ages, so happy to chat with you again! The Mystical Cats Tarot was a really great project to work on, it was a subject near and dear to my heart. My partner on the project author Lunaea Weatherstone had so many great ideas and marvelous insight into the cat world; it was a joy to create this deck with her. We endeavored to create a tarot journey told by cats that were just being cats while treating these feline spirits with humor, love, and respect. We’ve been delighted with the responses! People seem to really relate to this deck and the cats that live in our mystical world. Many people find cats in the deck that remind them of their own cats. We’ve also had a great number of people that find it works well for them when they do readings. Every time we turn around these cats bring another blessing, we were nominated for a COVR award at INATS, and have been delighted to see the deck produced in several languages too including Czech, Chinese, and French! TWPT: Meanwhile you have decided to try your hand at something new...writing a book. What was it that prompted you to consider writing a book? Was it something that you had been considering doing for a while? MM: I actually have wanted to write a book for quite some time. I’ve been writing articles for Llewellyn’s periodicals since 2007 and then I wrote the book that accompanied my Celtic oracle deck Voice of the Trees, so it just seemed like a natural progression to write a standalone book. When I finished the art for Mystical Cats Tarot I started exploring some ideas for books I had been bouncing around and actually began working on a couple proposals. Before I really got started on the ideas I had left on the back-burner, there was a call for authors who were interested in submitting a proposal for a book about witch’s mirrors to Llewellyn! I sent the acquisitions editor an impassioned email about all the ways I had worked with mirrors in my practice. She explained that it was part of Llewellyn’s Witch’s Tools series, the first of which was Deborah Blake’s The Witch’s Broom which I had also illustrated. I was delighted when they accepted my proposal for authoring The Witch’s Mirror and I got the contract to write my first book that wasn’t associated with a deck! TWPT: Was it a different mindset for you writing a book compared to when you are working on your latest artwork? MM: Writing and illustrating are two sides of the creative coin for me. I feel the need to create and use my work to communicate with others; these are just two different methods for doing that. I’m one of those people who need to create in order to be happy and well balanced; either discipline seems to work to keep my brain in love with life. I had already created a project that I both wrote an illustrated when I did The Voice of the Trees oracle, It’s really just two different ways to communicate, visually or verbally. When I did The Voice of the Trees I knew that I would be using both of those methods to tell the story of the Celtic ogham and the people who used it, this project was a bit different because even though I knew I would be adding a few illustrations, the lion’s share of this project was the written word. TWPT: I didn't look really close at the cover to see if your signature was on there somewhere but did you get to draw the cover for your book or is that like a conflict of interest :) ? MM: I don’t think it would necessarily be a conflict of interest, but in this case I didn’t do the cover art. Since The Witch’s Mirror was part of a series of books they had the same artist do all the covers in the series for consistency’s sake. John Kachik is the artist creating the delightful covers for the entire series, and I’m honored to be drawing the interior illustrations for the whole series. That made it extra fun to be able to do the interior illustrations for The Witch’s Mirror. In fact, I’m currently working on sketches for The Witch’s Cauldron by Laura Tempest Zakroff another book in The Llewellyn’s Witch’s Tools Series. She’s also a very talented artist, so the pressure’s on, I really want to make her happy. It’s a great book and John Kachik’s charming covers are always the inspiration to get me started on the interior illustrations for this series. TWPT: Your new book is called The Witch's Mirror which is one of Llewellyn's series of books about the tools of a Witch. First off what was it about doing a book about the witch's mirror that attracted you to the project? 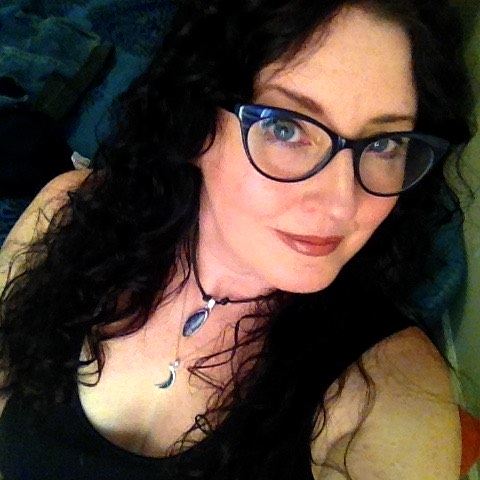 MM: When I was new to my path and discovering how to use magic to make my life better I was a newly divorced working mom just making ends meet. I didn’t have a lot of money or resources for exotic tools or ingredients so used whatever I could get my hands on to make my magic. I worked with mirrors on quite a few occasions because it made sense. Having gone through a divorce I needed to reflect negativity away from me and my home, being a food service worker I needed to multiply what I had, and starting a new life I needed to do a lot of soul searching. All of these things I accomplished with mirror magic, it just made sense. Interestingly it was only after I had the go-ahead to submit a proposal for the project did I remember that my late grandfather was a mirror maker! He hand crafted huge telescope mirrors for astronomers all over the country in his day, so I felt like he gave his blessing to the project. The more I explored mirror magic, the more magic I was inspired to create. Even after the book was complete I was still finding more information and also coming up with mirror spells and meditations! I presented several at my workshops to accompany my book signing events for The Witch’s Mirror. TWPT: Was this a topic that you knew a lot about going in or was it a mix of personal experience and research? Did you enjoy digging into the history of the mirror as part of writing this book? MM: When I first heard they were looking for proposals I felt a big rush in my heart because of my personal experience in instinctively working with mirrors for magic. The concepts of how to use them just made sense to me. I also added tons of research to the base of my personal experience. I wanted to explore how mirrors work optically, how the shapes of mirrors affect how they reflect and bend light because I knew that the magical use would follow the physical use of each kind of mirror. I discovered through experimentation that this method for determining how to use magic mirrors worked very well. I had remembered little snippets from various books in my own magical library, some books had more than others. Entire books are written about using black scrying mirrors, but this book was supposed to be about both black and silver mirrors and to include divination, spell work, meditation and more. I didn’t own, nor could I find any books just about using mirrors for magic. It both frustrated and excited me because it made the research a bit daunting, but it also meant that the book would be innovative which made the work so worthwhile. It was a blast researching the history of mirrors and their applications in mystical practices. I actually love doing research, discovering new things, making connections, I love digging through stacks of books and jotting down notes. What a nerd I am! TWPT: Was there a format for the Witch's Tools series of books that you had to follow or was it pretty much up to you as to how to present the information? If you had a format to follow did that make it easier for you to organize your book and allow you to concentrate on the content instead of presentation? MM: There is a somewhat set format for the series, in that there are certain things they want to be included in these books, and I did find it to be a really helpful jumping off point. The inclusions of historical references, popular culture, deities, etc. were some of the things that all the books have in common so far. The snippets of folklore scattered throughout the books are also consistent with the series format. In the editing process we did do a little bit of chapter shuffling and re-organization once I finished the manuscript to help the flow. The other thing that this series has in common is that they all include contributions from other authors. It was fun to reach out to several of my author friends to write their views and experiences with mirror magic to add to the book; in return I’ve also gotten to contribute a couple paragraphs to The Witch’s Broom and The Witch’s Cauldron. It’s great to add other points of views from these excellent authors to the material. TWPT: When did you start working on this book and how much of that total time did you spend doing your research? Looking back was it easier or harder than you thought it would be taking all of the information both personal and researched and weaving it into an entertaining book that thoroughly covered the topic? MM: I think I initially spent a couple of weeks going through several of my own books of shadows, piles of books on my shelves, and also did some research online as well as downloading several books that had good information to add to my library. I made tons of notes which I organized in a Word document. I also did quite a bit of extra research as I wrote double checking and cross-checking so it’s hard to say exactly how much time I spent on research total. I really try very hard to present accurate information, but I do the same when I create art, so this was nothing new to me. If I’m going to illustrate a spear, a magical seal, or a historical costume I want it to be right. I guess I don’t consider it easy or hard just part and parcel of the process. I honestly loved every step of it from the research, to crafting original spells, to going over the edits both before and after submitting it. There were times when I was too busy to cook so we had pizza, or my hair looked like a fright all day, but it’s just part of writing. To me taking any project from concept to a finished thing you can hold in your hands is the most enjoyable magic that there is! TWPT: Tell me about what a reader will find once they buy your book and start working their way through it. History? Rituals? etc. MM: When I began researching the book I found a message board online where someone was claiming that mirrors hadn’t been around very long so mirror magic was pretty new. I set out to debunk that statement right off the bat, tracing mirror magic back to obsidian mirrors of the Neolithic period. The history of mirrors through the ages is infused with magic every step of the way from ancient Rome and Egypt, to Catherine de Medici, John Dee, and even some cool things the Victorian Spiritualists did with mirror magic. I had great fun looking at the pop culture aspect of mirrors, magic mirrors in literature, movies, and television, and even urban legends and childhood games like Bloody Mary. The book is also a practical guide. I have methods for crafting, locating, and enchanting your own mirrors and mirrored objects to use for magic. I’ve included a whole chapter of magical formulas for mirror washes and fluid condensers to be used for many magical purposes. Readers will find a variety of original mirror spells in this book. Some are quick and easy spells for when you’re on the go, some are more complex, and a couple not for the faint of heart! I’ve included spells for manifesting your dreams, glamoury, prosperity, protection, blessing your space, divination, spirit communication, self esteem, healing and more. Readers will also find some mirror meditations for self healing and discovery as well as information about mirror shapes, the many kinds of magic mirrors, and even a guide to scrying symbols and colors. 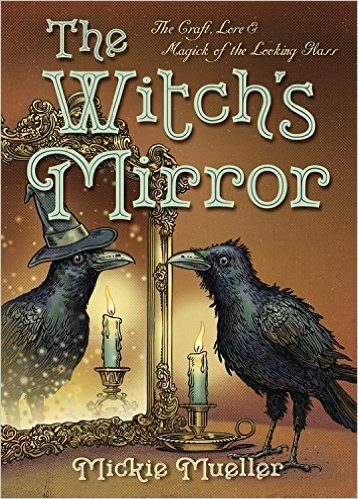 TWPT: Were there things that surprised you about the witch's mirror that you didn't know before you started to write the book? Any tidbits you'd care to share? MM: Oh definitely! For instance, I had no idea that the Chinese armies of the 13-17th century had special armor made of convex polished metal mirrors that were meant to deflect both physical arrows but also repel psychic attack during battle! When I read about the Victorian Spiritualists use of special rooms with mirrors called psychomanteums to contact the spirit realm I was intrigued. I found tons of references like this, the deeper I looked the more I found. Researching this book was how I learned about two kinds of witch’s mirrors that have both become staples of my practice. 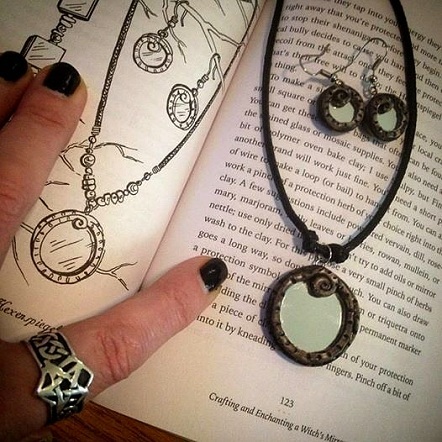 One is the small protective mirrored jewelry known in German folk magic as hexenspiegels, and the beautiful convex Oeil de Sorciere mirrors crafted in sixteenth century France offering both blessings and protection, a spiritual eye looking out for you. I invented ways to craft both of these mirrors for my own use and have shared with my readers how to do the same. One of the most surprising things I learned while working on this book is how many people have very serious fears about mirrors. I even learned that there were some magical practitioners that warned against the use of mirrors in magic and suggested that they could only be used to harm. Having used them myself judiciously for years in my own practice, I knew that just wasn’t true. 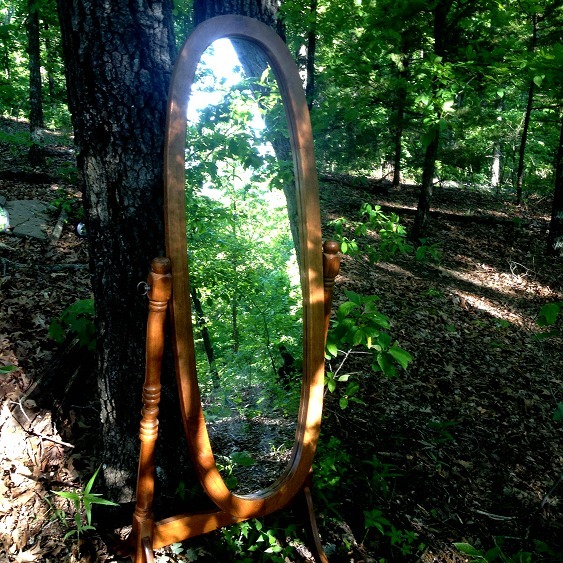 Superstitions about mirrors have come down to us through history along with the evolution of mirrors themselves. As witches, I feel that we grow in our power when we shine the torch into the dark and see what is really there instead of giving into fears of the unknown. I contend that the mirror is a tool of the witch like any other and that the intention of the witch is key to how it is used. TWPT: Tell me about the goals of this series of books that cover the individual tools that a witch might use in rituals or for spellwork. MM: I think that the process of deeply examining the tools that we use for magic has allowed the reader create a stronger bond with those magical tools. This is important because in magic our tools are an extension of ourselves and our own power; our tools become part of us in many ways. When we use a wand, broom, or mirror for our magic, by knowing the history behind its use, remembering the first time or our favorite time we were exposed to that tool in fiction, understanding how it’s made, all of these things make us think a little deeper and bring more understanding to why we do what we do and how it all works. The other thing that I have noticed in this series, is that while writing an entire book about a specific tool the authors have been challenged to find new and innovative ways to use each tool, thus adding more tricks than ever before to the witches ever growing toolkit. TWPT: Was it difficult for you to wear the hat of both artist and author at the same time as you wrote the book and continued to work on your artwork? For you personally which discipline was harder... writing a book or creating a new piece of art? MM: Writing and illustrating (at least for me) seems to emanate from different parts of my brain. I basically didn’t really do much art once I got into writing mode. I did have several book illustration jobs come down the pipeline while I was writing, so I just looked at the deadlines and juggled the jobs accordingly. I would often have one to three “writing days” followed by several “art days.” I would work on sketches for another book then send them in for approval which can take several days to hear back about. Then I could go back to work on the book while I waited for approval on sketches. I just worked in this manner until I got everything done that I needed to. I’m seldom bored, there’s almost always some project or another vying for my attention, I just keep plugging away until I get there. The difference between creating art and writing are very interesting. I find the process for me is equally challenging and rewarding but in very different ways. For instance, when I’m working on art I can multitask a lot more, I can talk on the phone, or to someone in person without skipping a beat. I often binge watch Netflix or Amazon while I work on art, as long as it’s something I’ve already seen a few times, because I’m really only listening to it. For me art can be a social activity, I sometimes bring my project into the living room or kitchen table to hang out with family while I work. Writing is another beast altogether. I find that writing is very solitary, but if I have peace and quiet I can sit for long periods of time and get tons of work done. Usually I sit alone in my studio at my laptop and just pound away at it, I usually have music playing, but only instrumental music works for me because I also love to sing and the lyrics distract me. Writing looks something like this: me with a cat on my lap, coffee in my cup, classical or New Age music streaming, and click, click, click of the keyboard. TWPT: What kind of responses have you been getting from your followers about your new book? Uh Oh! Mickie assures me that there are several cures in the book for the proverbial bad luck this will bring. That's good news! MM: I’ve been really excited and humbled to see that people really seem to be enjoying the book. I’ve had lots of people send me messages to let me know that they’ve either worked mirror magic before and are happy to learn more, or that they’re delving into using the mirror as a magical tool for the first time. When I create something whether its art or the written word I strive to make something that I would want, then I hope that other people might want it too. I put a lot of love into this book, so it’s pretty great to get good feedback from the readers. TWPT: So now that you have successfully written your first book is it something that you might want to try again? Why? MM: Oh yes! I really love writing and I do still have a several half finished proposals in folders on my computer that I still need to breathe life into. I have a lot to say about magic and life. I love to work magic into everything that I do and I love to share my ideas on how to do that. I have quite a few ideas for books right now; I just need to decide which one is next. I’m actually working on another tarot deck which is contracted with Llewellyn right now, I’m illustrating it and my husband Dan Mueller who was deeply inspired by the topic (which is currently top secret) is writing the book. We work really well together; we have interpersonal shorthand that allows for a really cohesive concept, I can’t wait to announce this project! So for now, I’m in the process of plowing through the majors and once they’re done I plan to take a little time off and finish up the proposal for my next book, then back to illustration. You know me, bursting with magic and never, ever bored!